What is Windows System Optimizator? 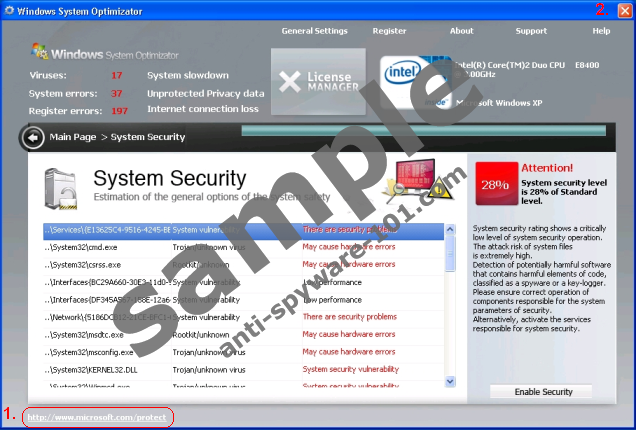 Windows System Optimizator is a new fake antispyware software. Although there are many fake applications familiar to Windows System Optimizator, this one is far more advanced and very hard to beat. Do not let the name convince you otherwise as Windows System Optimizator is dangerous and will not bring any good to your computer, your bank balance or your life. Usually fake applications get into a computer through browser security holes or by a disguised trojan and Windows System Optimizator is no exception. Just after system infection you will be welcomed by a “Microsoft Security Essential Alert” warning. Accepting the warning will automatically install the Windows System Optimizator software and will force to reboot the computer. And just after the reboot Windows System Optimizator gets very tricky – it won’t allow to use anything else, and there is almost no way to fix the blocked computer (even safe mode). It will show various warning messages and will constantly ask to purchase a full version. We analyzed the software and found a way to bypass the locked screen. Click the URL (1) at the bottom of the screen directing to the Microsoft website. After the browser opens up you will be able to close the Windows System Optimizator application (2). NOTICE, the program is still in your computer and you must delete Windows System Optimizator with all of the associated files, or otherwise the same blocked screen will reappear the next time you boot up the PC.